Pets that constantly jump off sofas, beds, and other furniture can place unnecessary strain on the joints. If you want to maintain and protect your pet’s joint health, pet stairs make a smart way. 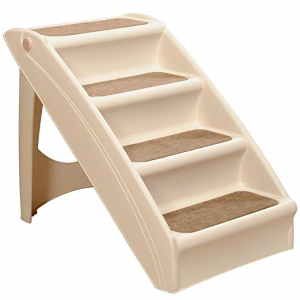 Pet stairs help your pet easily and safely get to hard to reach places and back down from them. A must have for anyone who has a pet that can’t jump high. Are your looking for an economical way to help your pet reach their favorite places? If yes, you cannot go wrong with the Solvit Pup Step Plus Pet Stairs. 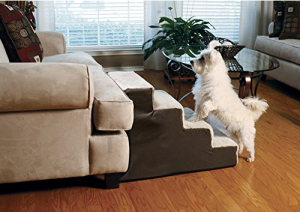 Ideal for small or medium-size dogs, these stairs feature safety siderails that allow your pet to climb with confidence. Super lightweight at only 5 lbs. Supports over 120 lbs. No assembly required. Now your pet can easily and safely reach her napping place. Make it easier for your pet to get onto the bed with the Majestic Pet Links Polyester Slipcover Pet Steps. These 4 step pet stairs are perfect for pets suffering from joint problems, aging issues, arthritis or other disabilities. They will help your dog or cat navigate onto furniture, window sills or beds easily and safely. Made with a 100% Polyester slipcover that zips off for easy cleaning. Also features a heavy duty waterproof 300/600 Denier base that makes them great for any surface. Your dog have a terrible time getting up and down off bed? No worries. 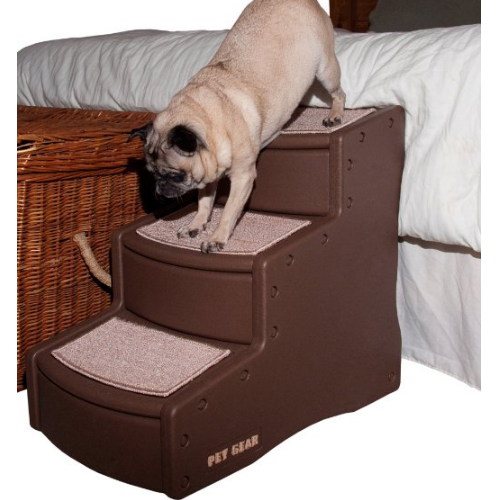 With the Pet Gear Easy Step III Pet Stairs, your pet can safely get to hard to reach places. The stairs feature wider and deeper stair landings for small and large dogs. The rubber grippers on bottom keep step secure and in place. Suitable for pets up to 150-pounds. The carpet tread is removable and machine washable for easy cleaning. Easily snaps together with no tools required. Now you don’t have to worry about your pets hurting themselves getting off the bed with the Dallas Manufacturing Co. Home Décor Pet Steps. 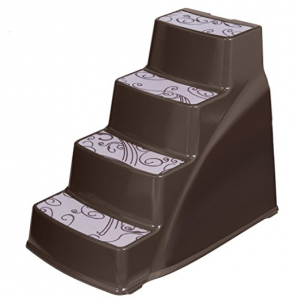 The steps are padded for extra support and hold up to 200 pounds. 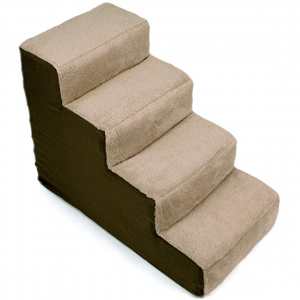 Steps are constructed of durable yet light weight honeycomb cardboard. Very portable. Also comes with convenient tote handle on back. Removable cover is 100% polyester and machine washable for easy care. If you have small or aging dogs and cats that often have trouble accessing elevated surfaces, don’t hesitate to buy the Petmate Pet Step II for them. 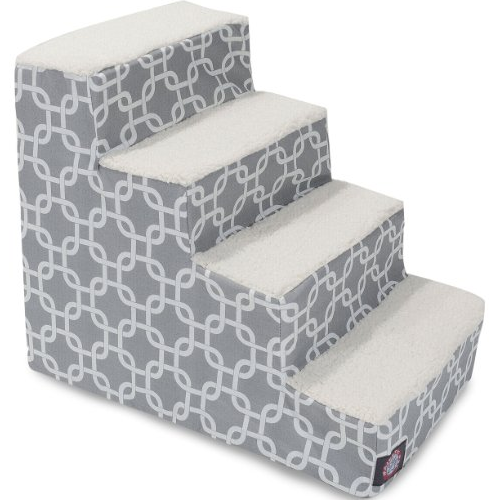 The steps feature decorative fabric treads for a non-slip surface. It is lightweight with an easy grip handle makes moving easy. The rubber feet keep from sliding on hard floors. Designed with ribs for added stability. Works to fit most sofas and beds. No assembly required. Perfect for small dogs and cats.